PRODUCT DESCRIPTION: Bluish/black seed like granule – almost like poppy seeds – which are embedded with Methoprene. Odorless and undetectable when applied properly, the active is a very safe material to use around the home. Methoprene is a growth hormone, which is essentially a protein, so it poses little risk when used properly. In fact, it won't impact any adult insects; only their young are prevented from being able to grow to reproducing adults. WHERE TO USE IT: Areas where you have standing water or where water may accumulate. This includes bird baths, old tires, tree holes, stumps, mulch, flower beds, compost piles, drain ditches, water gardens, ponds, lakes, flower pots and just about anywhere mosquitoes may take advantage of accumulating water and moisture. RATE OF APPLICATION: 2.5 lbs will treat up to 5445 sq/ft for 30 days. Apply monthly. I have a half acre swampy area that stays flooded around three month per year max of 2 feet deep. Big source of Mosquitos. 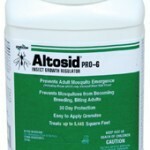 Is this (altosid) the best product? And how is best way to spread the granules? There are several things to consider when making your decision. First and foremost, understand that the Altosid would only handle the water you treat. So if there is neighboring land, other ponds you can't access or just a well irrigated landscape around your home, its entirely possible for the problem to continue regardless of the drainage area getting treated. In other words, you could very well control the mosquitoes in the water but that alone may not help if they have enough areas around the other parts of your land to reproduce. As for how to use it; basically you'll have walk (or paddle) over the surface of the water and evenly disperse the granules. It will take 1 jar for every 5,000 sq/ft of water so all told, you'll need to use 4 jars per month. That means for 3 months, you'll need 12 jars along with some time. Plus the cost will be around $400-500 to treat. Oh, and it won't kill any adults that come onto your property from other areas so it could turn out not to help that much if the problem is stemming from another source. Now something to consider which I feel would be a better way to go is to fog. Using Essentria IC, I'm certain you'll be able to get any biting pest under control. Labeled for use over water, its relatively inexpensive to use and will kill adults immediately. And with our Back Pack Mist Blower, you'd be able to treat the entire wet area in 5-6 minutes. I know because I use my back pack mist blower to treat my .75 acre lot and it can pump out 3 gallons of mixed spray in less than 10 minutes. Now true, the machine is pricey. But I've had mine for almost 15 years now and it still runs like new. And its safe to say it would pay for itself in just 2 years because in the end, you'll be using so little chemical to control the problem. So to understand the savings, you'll only to use 4 oz per gallon of water to kill mosquitoes. Expect to treat once a week until the problem was gone; once every 2 weeks to keep it under control. To me, this would be the better way to proceed. Especially since the treatments will take care of pretty much any nuisance pest you have in the area. 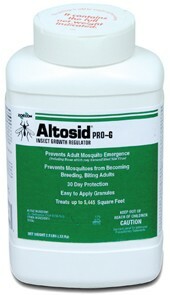 In the end, I believe a combination of fogging and applying Altosid would be the "best" way to proceed. But if I had to choose, I'd invest in the machine since it will last for many years and pay for itself by using less chemical and less time.